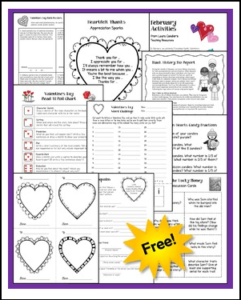 Need engaging printables and activities for February? This 26-page packet offers ready-to-use lessons, printables, and activities for February that foster higher level thinking while motivating students. Activities include math word problems, a candy heart fraction lesson, a friendship poetry activity, a word challenge, and directions for writing a President or Black History biography. The February Activities freebie is offered as a sample of my monthly activity packs. See below. Newly Updated! Most recent revision was February 4th! More Seasonal Printables and Lessons from Laura Candler!